Product #16864 | SKU UDC | 0.0 (no ratings yet) Thanks for your rating! 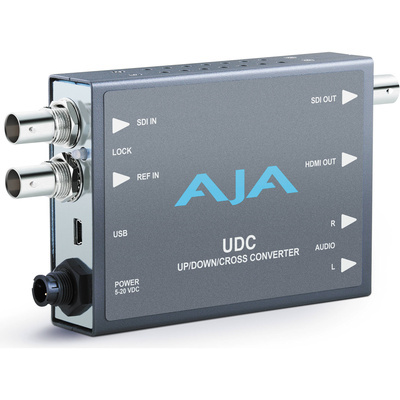 AJA's Up/Down/Cross Convertor is a broadcast quality Up/Down/Cross Mini-Convertor which can convert between SD, HD, and 3G video formats. Using the same AJA industry leading conversion technology as in our model FS2, the UDC provides very high quality conversions in a cost-effective package. I/Os include SD/HD/3G SDI Input and Output, HDMI output, and 2-channel RCA style audio output. The UDC can be controlled by local dipswitches with additional control available via USB and AJA's MiniConfig application. A Reference Input allows the UDC to be locked to a local reference.